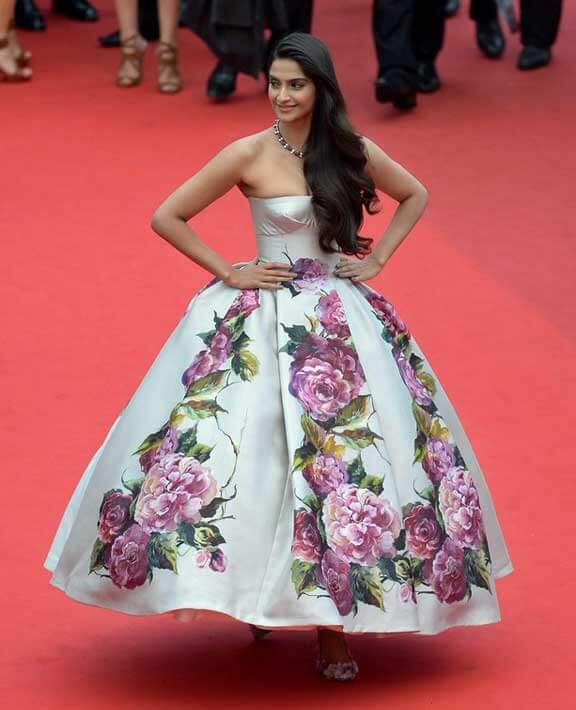 After her disastrous outing in the sari/gown/jacket and scary makeup yesterday, Sonam Kapoor’s done a massive turnaround at Cannes. Today, the Bollywood star took to the red carpet for the Jeune & Jolie premiere in a strapless petal gown by Dolce & Gabbana, paired with a chic necklace by mom Sunita Kapoor. The gown is dramatic enough to take centre stage, without shouting out shrilly. Plus, Sonam looks comfortable wearing it, which shows through in much more confident body language. Though, just maybe it could have been a tad bit longer and actually swept the floor like a princess ball gown normally does. This ankle length seems a bit awkward at first look. And a tiny little part of me wants to say that she looks like a birthday cake… but that would be nitpicking. Let’s just count our blessings where we get them. It’s a gorgeous gown and if you can’t go slightly OTT at Cannes (slightly, not crazily! ), where else can you pull it off? Even the makeup is soft and understated – all pretty pinks and sophisticated nudes – while the glossy side-swept hair gives her a fairytale princess look. Sonam looks years younger than yesterday… yes, it’s definitely an improvement and so much more appealing. Do you agree that this look suits her better? Love it! Yes, it looks like a birthday cake. But redemption is finally in the air. We hope (gulp). Keep the posts rolling Anubha. Love them. Love them. Love them. Ooooo I can’t wait for the Ash disaster 😀 Will she make an appearance? Have you seen the sound of music? The dress reminded me of the frocks the girls got from the curtains!